New Delhi/Mumbai/Hyderabad: The government will boost printing of ₹ 500 notes by as much as five times to meet an unusual spurt in demand for cash in some states where ATMs are running dry in a throwback to the days following the announcement of demonetisation in November 2016. To combat the cash shortage, the government plans to print around ₹ 2500 crore of ₹ 500 notes daily in the next few days, said Subhash Chandra Garg, secretary at the department of economic affairs. “There has been some unusual spurt in the demand." News reports from various states, including Andhra Pradesh, Madhya Pradesh, Telengana, Maharashtra and Bihar, said that ATMs were facing a cash crunch. The government and Reserve Bank of India (RBI) officials attributed the shortage to unusual local demand in a few states and instructed banks to improve their cash management. Finance minister Arun Jaitley called the cash crunch a “temporary shortage". In a statement of Tuesday evening, RBI contested that there is a cash shortage. It said a few pockets may have felt the shortage owing to “logistical issues of replenishing ATMs frequently and the recalibration of ATMs being still underway". RBI said that it is increasing banknote output in all its four printing presses and “taking steps to move currency to areas which are witnessing unusually large cash withdrawals". Garg said that demand for currency notes had doubled in the past two months to around ₹ 40000-45,000 crore. In the first fortnight of April alone, the demand is close to ₹ 45000 crore, he added. “The cash crunch is mainly due to hoarding but the exact reason for this not known," a senior banker with a state-run lender said on condition of anonymity. Ground reports from various parts of the country point to a crunch. For instance, Mohd. Abdul Nayeem, a resident of Mehdipatnam, Hyderabad, said that the problem has been there from nearly three weeks now, and that cash loaded in the few ATMs in his locality is withdrawn within minutes. While some State Bank of India ATMs had cash in certain areas, private bank ATMs were either shut or had “no cash" signboards outside. In Maharashtra, parts of Vidarbha region like Nagpur, Amravati and Chandrapur districts witnessed a number of ATMs going dry, according to local Marathi newspapers. The reasons for the sudden spurt in demand are still unclear. The probable reasons that are doing the rounds are the following: One, cash is being routed to Karnataka where state elections are scheduled to take place on 15 May. Two, people are increasing their cash hoards because of recent frauds at banks such as the one at Punjab National Bank and fears over the Financial Resolution and Deposit Insurance Bill, which had a so-called bail-in clause. A bail-in involves rescuing a financial institution on the brink of failure by making its creditors and depositors take a loss on their holdings. Mint could not independently verify these claims. However, the government is not supplying any additional ₹ 2000 notes (around ₹ 6.7 trillion of ₹ 2000 notes are in circulation) as its need has not been felt, Garg said at a press briefing. He added that the government has around ₹ 2 trillion in currency chests and in RBI offices to take care of the increased demand. “There is a demand-supply mismatch in currency notes across several states. Cash hoarding could also be one of the reasons for this cash shortage. We have seen large cash withdrawals in ATMs rising to pre demonetisation levels," said Navroze Dastoor, managing director of NCR Corp. India Pvt. 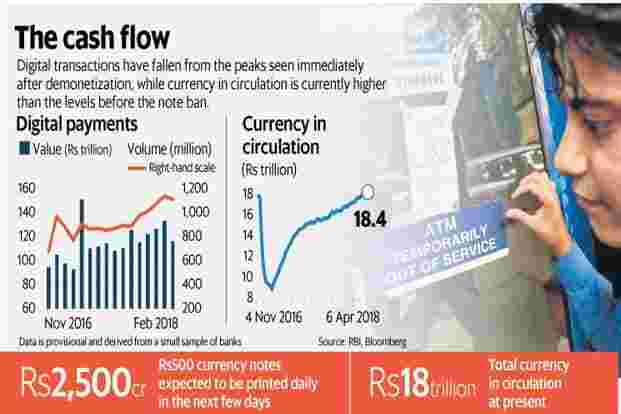 Ltd.
As on 6 April, total currency in circulation was ₹ 18.43 trillion compared to ₹ 17.98 trillion a few days prior to the 8 November 2016 invalidation of high-value banknotes. An estimated 10-12% of the total ATMs are facing a cash crunch, said a government official on condition of anonymity. The government estimates the situation will normalize in the next one week, a government official said, requesting anonymity. However, a second official aware of the matter said that printing more notes could take more time. “Contracts for purchase of ink and security thread expired in December 2017. Bharatiya Reserve Bank Note Mudran Pvt. Ltd will now have to float new tenders for the raw materials which is likely to take one year. However it can take special permission from the government to buy fresh supplies," said another person aware of the matter. “RBI will take three months to improve cash supply in the system," the person added. Opposition parties were quick to point out the mismanagement by the government and remind the public of a similar shortage faced in the aftermath of demonetisation. “Seeing reports of ATMs running out of cash in several States. Big notes missing. Reminder of #DeMonetisation days. Is there a Financial Emergency going on in the country? #CashCrunch #CashlessATMs," tweeted West Bengal chief minister Mamata Banerjee. Sitaram Yechury, member of the Communist Party of India (Marxist) wrote on Twitter, “ATMs were empty in November 2016. ATMs are empty now. And the only party flush with cash is the BJP: the people suffer," adding that the country is paying the price of demonetisation announced by the Modi government in November 2016. Alekh Archana and Abhiram GhadyalPatil in Mumbai, and Maulik Pathak in Ahmedabad contributed to this story.